Mary Paul Lalai, mother of one of the abducted teenagers of Chibok in Borno State has been confirmed dead. The confirmation was made by the member representing Chibok constituency in the State House of Assembly, Aimu Fona. He told The Nation that on hearing the shocking news of the abduction of her daughter, the mother collapsed and she eventually died of heart attack. 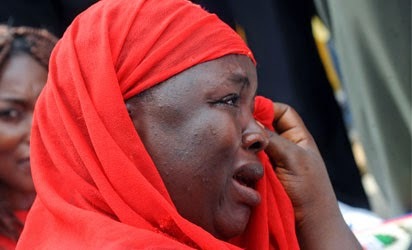 Left to mourn the late Mrs. Mary is her husband who is still hoping for the release of two of his daughters held at the Sambisa Forest stronghold of the wicked Boko Haram sect. This is really sad. May her soul RIP!